Philadelphia, PA — As we constantly repeat here at the Free Thought Project, being entirely innocent is no defense against getting arrested or abused by police officers. 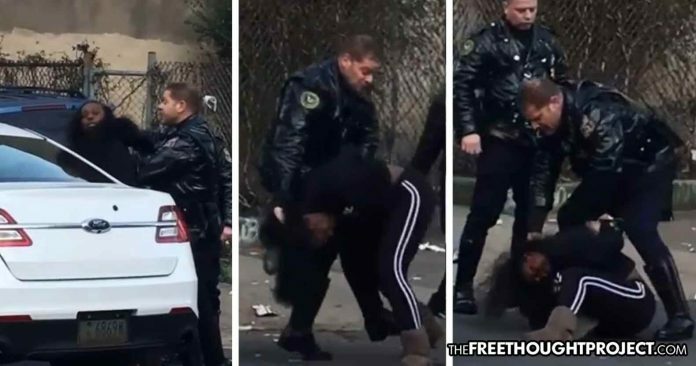 And, as the following video illustrates, being an entirely innocent woman—in handcuffs—is no defense from being attacked by police either. The vehicle owner showed his confirmation number from police to FOX 29 proving that he reported it found, but he says they have simply forgotten to remove it from their list. He explained to FOX 29 that he’d been stopped several times because police have failed to remove his vehicle from their list of stolen vehicles. Indeed, police encounters like this one all too often turn deadly. Had Harvin done more than just swear at the officers and actually physically resisted her unlawful arrest, things could have taken a violent turn for the worse. Lyndo Jones is lucky to be alive after his encounter with police in November 2017 left him with severe injuries that forced him to spend several days in the intensive care unit chained to a bed. He was entirely innocent, yet he was shot by police who mistook him for a car thief. Officer Derick Wiley, a 10-year veteran of the Mesquite Police Department, was charged with aggravated assault for shooting Jones but in September, the officer’s trial ended in a mistrial.